All the dogs have leapt from the Exact. Same. Spot. About a half-hour’s drive north of the Scottish city of Glasgow there’s a 19th century castle called Overtoun House. In the 160 years it’s been around, the estate has served as a movie set, a maternity hospital and a place of recovery for Allied soldiers during WWII. With that sort of history, you’d think supernatural activity would abound — but you’d be mistaken. That honor goes to the nearby Overtoun Bridge, which was a mostly harmless structure for decades after it was built in 1895. There are some patterns among these terrifying jumps, which end on the jagged rocks under the bridge. All the dogs that jumped were long-nosed breeds, those traditionally used for hunting for their exceptional sense of smell. And all the dogs reportedly jumped from the same spot — between the last two ramparts on the right side of the bridge — and always on a clear, sunny day. Hold up. Is dog suicide even a thing? He adds that animals close to death will seek out a quiet place to spend their final moments in dignity, but that this has to more to do with a deteriorating physical condition and less with any sort of premonition. He should know. 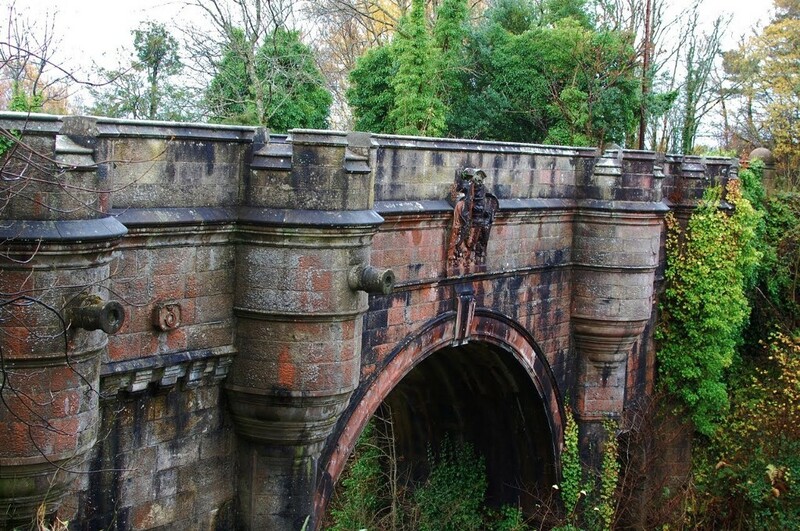 He traveled to Scotland to lead a surviving dog down Overtoun Bridge. But we’ll get to him later. The ancient pagan Celts believed in “thin places” — places where the boundary between heaven and earth is especially ambiguous or even non-existent. Author Paul Owen believes “thin places” exist, describing them at length in his book — he just doesn’t believe the bridge is one of them. He does, however, think the bridge is haunted — by the spirit of Lady Overtoun, who is said to have walked along the bridge after her husband’s death in 1908. Owen is so convinced that he’s written a book on it, and while the cover does the author no justice (papyrus font? C’mon, guy) his conviction is palpable. A sinister presence might help explain the horrific events perpetrated by a man named Kevin Moy in 1994. Moy, who was 32 at the time, cast his infant son off the parapet, claiming he was the anti-Christ. He unsuccessfully attempted to follow his baby to death, but was thwarted when his wife restrained him (and then again a few hours later when police took him into custody after he failed to slash his wrists with a kitchen knife). Moy was found not guilty by reason of insanity and committed to the State Hospital at Carstairs. Although his severe clinical depression was the clear culprit, the location and timing of the tragedy (between the last two parapets on the right side, clear sunny day) did little to alleviate the bridge’s malevolent reputation. A reputation that led many to wonder — might there be a link between the ever-increasing suicide rate of nearby Dumbarton (where suicide was the leading cause of death among young men in the area in 2006) and the steady reports of dogs flinging themselves off the town bridge? This is where Dr. David Sands returns to our tale. The canine psychologist traveled to Dumbarton in 2005 in a final bid to solve the mystery of Overtoun Bridge, documentary camera crew in tow. Sands brought Hendrix — a 19-year-old dog that survived a leap from the bridge — along with him. He noticed the dog tense up near where she’d had her near-death experience. He concluded one of her senses was so triggered that she felt an unrestrained urge to investigate. The doctor decided to figure out which overloaded sense caused dogs to jump. He quickly eliminated sight, since the ivy-covered granite of the parapet was all that was visible from a dog’s eye view. Although the rush of the water below fully “dominated the air,” some locals theorized that a nuclear base at nearby Faslane, telephone pylons or some sort of structural anomaly in the bridge’s construction was emitting a disturbing frequency that only animals could hear. Sands brought in experts to test the entire span of the bridge, but they concluded that there was nothing acoustically unusual anywhere in the area. Having ruled out sight and sound, Sands predicted that a strong scent was over-stimulating the dogs and causing them to climb over the wall. 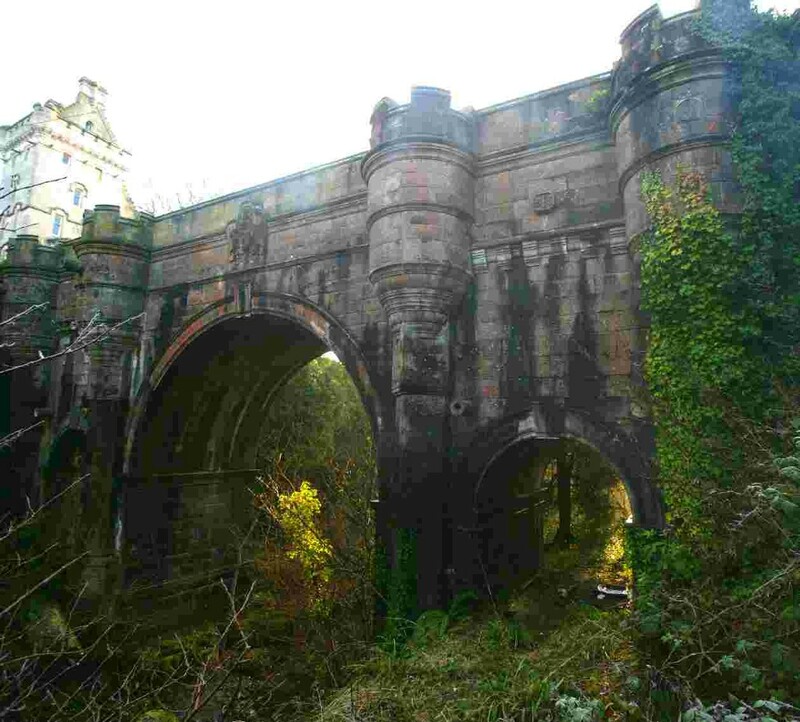 Sands realized there was a concentrated grouping of nests of squirrel, mice, and mink underneath Overtoun Bridge. To narrow down which of these may have been most appealing to dogs, Sands individually tested 10 long-nosed pups — 70% of whom headed straight for the mink, unaware of all else. 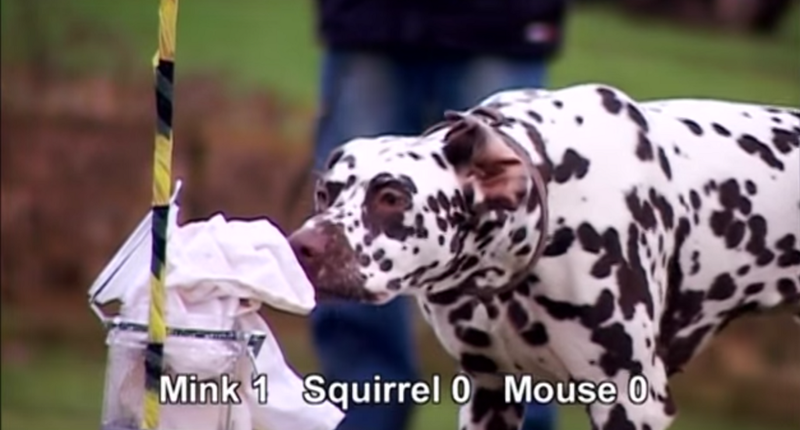 The smell of mink is super strong, musty, and utterly irresistible to dogs. If you’ve ever been within 20 feet of a ferret, you’ll be familiar with this particular stench. It’s also by far the most likely explanation for the canine suicides at Overtoun Bridge. Not only would that explain the consistency in weather on the days they jumped, since scents are strongest on dry days, but the timeline is consistent — the doggy deaths date back to a time when mink was first introduced to the area, sometime in the 1950s. While this theory is the most logical, it certainly leaves a few unanswered questions, like: Why do all the deaths occur between the same two parapets on the right side of the bridge? How come dogs don’t seem to jump off other bridges in Scotland — or anywhere else — that are near mink nests? The mink isn’t a definitive explanation, but it’s a comforting one. Far more comforting than the ghost of a grieving widow calling dogs to their maker, anyway. If nothing else, it’s nice to know the purity of dogs isn’t tainted by human emotion.